Have you tried barefoot running on the beach? 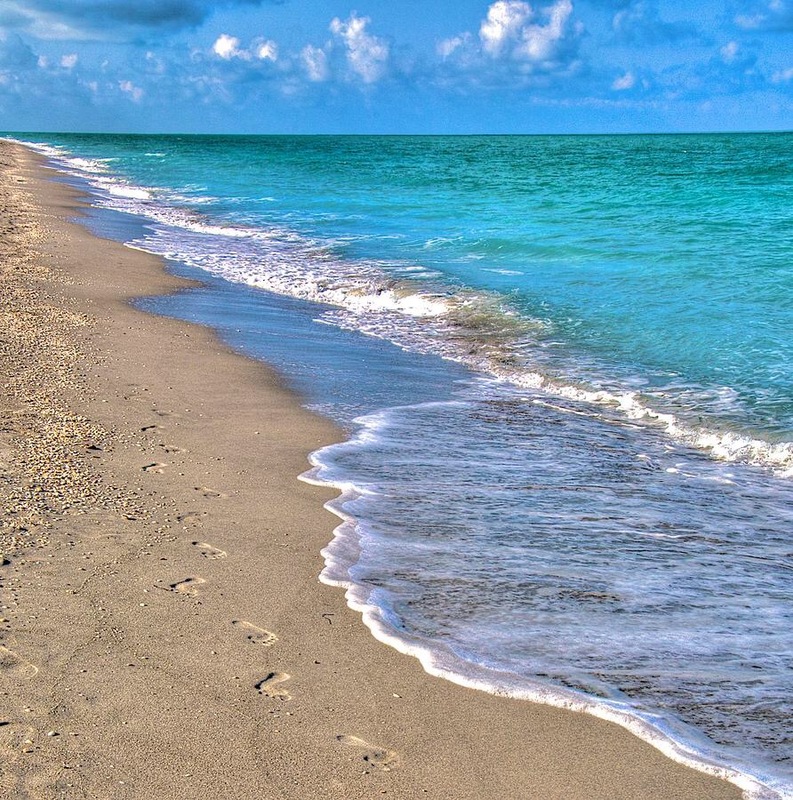 Footprints in the sand along the shore of turquoise water and light surf. Yesterday I woke up early and it was a beautiful morning. The wind had died down and the sun was out and I knew the beach would be perfect. The beach on Stocking Island is one of my favourite places in the world. The turquoise water is crystal clear and the white sand is soft underfoot. Best of all it’s practically deserted. I’ve never seen more than two or three other people no matter what time of day. The surf can get fierce on this beach when the winds blow in steady from offshore. That happens a lot. So when the winds shift and die down, it’s inviting and not to be missed. Grass opening up to white sand and beyond that turquoise surf. Okay, now to the barefoot running. I’ve read lots about barefoot running and how to great for some people. Sam’s daughter Mallory for example runs barefoot. But it’s never appealed to me. In ordinary conditions i need shoes. This I know. But this beach is way too soft for shoes. You just can’t run normally on it. By chance one day last week we (Renald and I) discovered that if you run softly and briskly you can get a rhythm going that feels really good. The sand gives just enough that there’s no harsh impact. But it is firm enough that unlike with shoes you don’t sink right down into it either. So on this beautiful early morning we went back and ran barefoot on the beach. Other than a woman and her dog we saw no one. And then we dove into the beautiful water for a cool down. 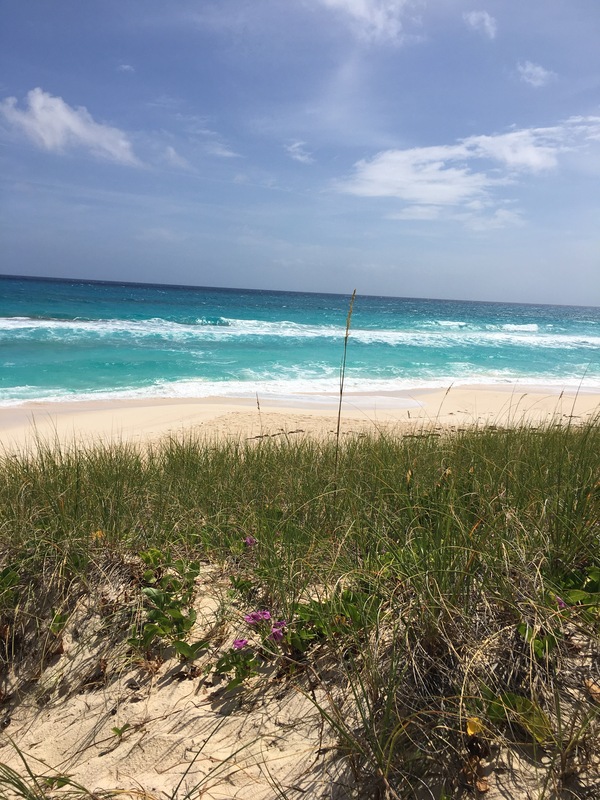 My sailing trip in the Bahamas is coming to a close and I feel good about the drins and drabs of training I’ve managed to squeeze in between the intensive R and R.
Thanks for indulging me by reading my indulgent posts about vacation training. Heading back to the north soon, hoping winter is over! Have you ever run barefoot on a beach? Elsewhere? Did you like it? Previous Post My mother the cyclist! It’s such a natural and relaxing experience. Great article, let’s get more people out to run barefoot! Tracy– It’s been great reading your posts from paradise. I’m a serious beach lover, and your stories and pictures are the perfect antidote to rainy New England April. re barefoot beach running: I have tried it on SC beaches, which are hard sand. My feet got chafed and a little blistery from the hard sand, so that didn’t work so well. I’m impressed that you took on running in softer sand. It sounds like you found an interesting and surprising (to me) way to enjoy soft sand beaches. Cool! Love running barefoot. My favourite place was on the grass fields, mostly used for cricket, in Canberra. I go barefoot a lot of the time, winter and summer, and it feels better to me. But I also have calloused feet from time on the Aikido mats!Though I’m not as much as a barefoot fan as Mallory who sings barefoot in very formal choir gowns.